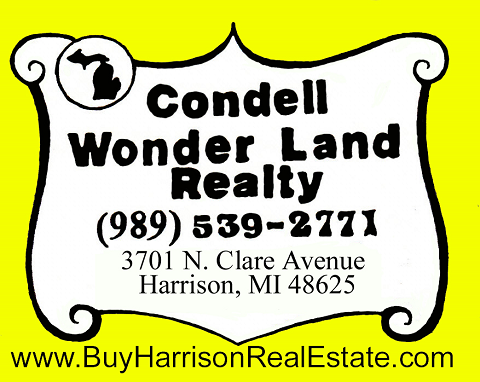 Condell Wonder Land Realty has been serving the Real Estate needs Harrison, MI. and the surrounding area for over 25 years. We are one of Harrison's oldest Real Estate Offices. If you are looking to Buy or Sell, we are open 7 days a week and will give you the service you deserve! Any Questions please contact us! Condell Wonder Land Realty strives to be your one stop Northern Michigan Real Estate Office. We have a great selection of Northern Michigan Real Estate For Sale; Homes, Homes on Acreage, Hunting Land, Waterfronts, Waterfront Lots, Acreage, Homes on Acreage, Lots, Cottages, Commercial, and Business Opportunities. As a member of the Clare-Gladwin Board of Realtors we have access to Hundreds of area MLS Listings. We service Clare County, Gladwin County and the following communities: Harrison, Clare, Farwell, Lake George, Lake, Gladwin, Beaverton and surrounding areas. Our REAL ESTATE STAFF are very familiar with the Harrison Real Estate Market, and we will do our very best to HELP YOU FIND THAT HOME, COTTAGE ACREAGE OR WATERFRONT YOU ARE LOOKING FOR! As is often said, real estate is about location, location, location. We have extensive knowledge of the Harrison, MI area and can help you find the right home for you or the right buyer for your home.